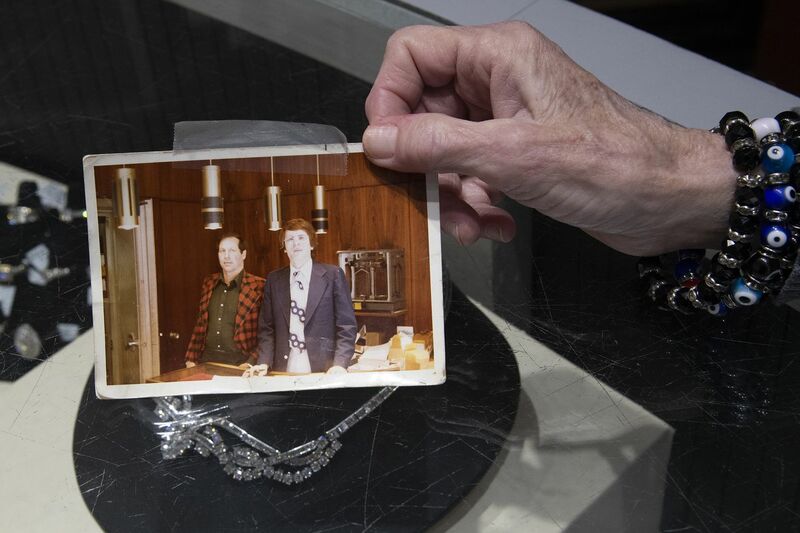 Becky Guise holds a photo of her late former boss and friend Michael Lauria (r) at Lauria's Jewelers in Philadelphia. The Row came to me. It glided up to the bar one night in 2006, in the failing seafood chain where I was toiling, a 500-seat Titanic off Washington Square. I had precious few customers until a pack of Jewelers Row merchants strode in. These were jewelers and bar owners, and behind them, some of the gem cutters, polishers, setters, solderers, and smiths that still labored in the workshops above the Row. Their leader, as if it could be anyone else, was Michael Lauria, the owner of Lauria’s Jewelers at Eighth and Sansom. Michael didn’t enter a place so much as occupy it. He was royalty on the Row, an old-school, impeccable dresser who had been working there since he was barely out of his teens, and had worked his way up to owning an iconic shop. His clientele ranged from Eagles to power brokers to, eventually, a certain broke bartender at a sinking fish joint. Michael treated all of us the same. He would cut deals the size of my salary, and then turn around and dig through the bins for a Valentine’s Day gift I could afford (with, in hindsight, probably some help from the big man). In a cutthroat place, all this cemented Michael’s benevolent reign. Michael Lauria, the owner of Lauria's Jewelers, in a rare untucked moment in Coco's around 2006. His court included John Cokos, proprietor of Coco’s bar, a burgundy-carpeted cave on Eighth Street that served as the Row’s clubhouse. And Gene Quigley, a bespectacled straight man to Michael’s one-liners, who had arrived on the Row as an awestruck 22-year-old in 1974, its heyday. That also described the crew that had just walked into my bar. Over the next few years, they deigned to allow me into the inner sanctum. In their shops, where they regaled me with stories of the street, its history, and characters. At Coco’s, beneath a tasteful painting of a woman in a fur bikini riding a chariot pulled by lions and tigers. Business on the Row and the passing of people could make times there feel like one long end of an era. By 2006, gone were five-deep lines at the counter, where traffic cops shepherded Rolls Royces down Sansom. Many of the jewelers in the upstairs rooms, the Old World specialists whose crafts were their life and whose word was their currency, were already being displaced by condos. So now comes my colleague Caitlin McCabe’s story about the eviction notices sent to several tenants on the Row, as a handful of buildings there are now potentially to become Toll Brothers high-rise condos. The beginning of the end, again, for the Row. Jane Theis, a silver and goldsmith who works in a room on the fourth floor of 704 Sansom, was one of those who got the notice. At 59, she’s worked on the Row since she was 19 — one of those specialists whose expertise and quirkiness fit right in here. Jane Theis, a jewelry craftswoman who has worked on Jewelers Row for decades, holds an eviction notice in her Center City workshop on Friday, April 12, 2019. The notice came this week from Toll Bros.
For so many denizens of the Row, it would have been hard to imagine that something more devastating awaited them than the fall night in 2012 when, at 68, Michael died of a heart attack in his Eighth Street apartment. Reds found him. The Row convened at Coco’s, where people were crying like a head of state had passed. In a way, one had. My seafood joint has been consigned, mercifully, to oblivion. John sold Coco’s, which is now a quasi-hip bar called Craftsman’s Row. Gene retired. Joe Murray wrote a crime novel called The Row. There are two lovable characters named Michael and Gene. I walked the Row on Thursday, worried about what the towers could mean for it. It would be a shame, I thought, if the new Row becomes a place where Michael wouldn’t have felt at home.